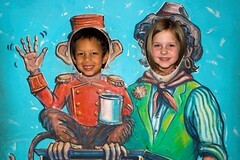 We went to the City Museum and had a blast. Olivia invited Izaiah and the two of them had a great time. They really liked running and climbing through the caves and tunnels. As always click on the photo or the Flickr link on the right to see a couple more photos from the day.